Blizzard added a new page to their Diablo 3 site, with some information about the Stash in Diablo III. It’s a nice overview, but it’s thin on specifics or details. Happily, I’m able to add some details that are not on the Blizzard page. We even have a movie! One thing that we only learned with the beta is that there is no non-shared stash. Each character does not have their own stash plus a shared stash; the stash is entirely shared, between all of your characters. The only storage that’s not accessible to all the characters on your account (aside from SC and HC not sharing items) is in your character’s inventory. 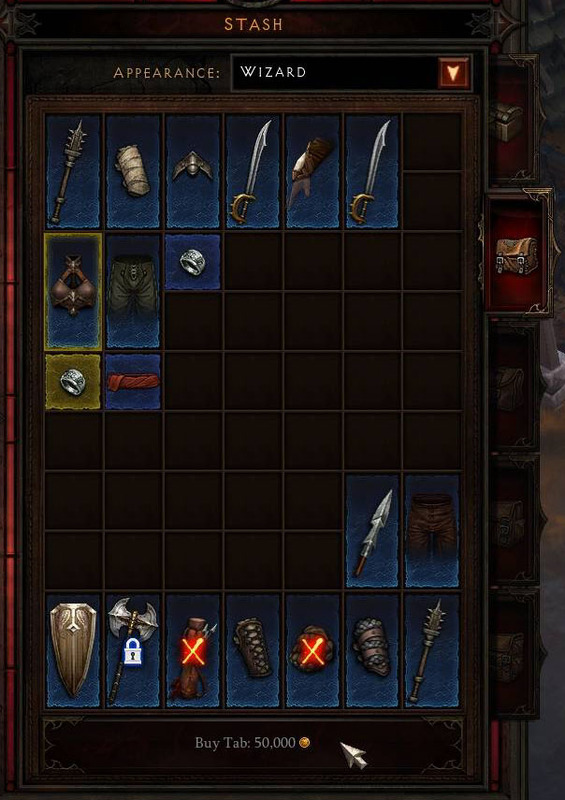 All stash items are shared, just like Diablo 3’s gold (for better or worse). One other interesting thing about the stash is the “Appearance: ________” drop down menu on top. This changes your view to that of the selected class, which is useful in order to see which items can be used by which class. For instance, an orb will wear the red X for every class but a Wizard. This also lets you toggle the inventory icon for items, which often varies between classes and/or genders. 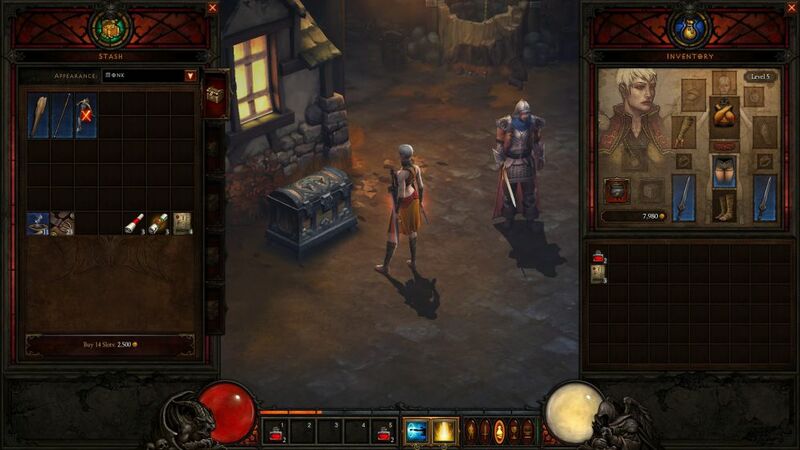 If the screens weren’t enough, here’s a short video of a stash being manipulated, from the Diablo III beta. 10×7 for one tab, 50×7 for all tabs. With items 2×1 you can have 175 of armors and weapons. You would need around 35 characters in Diablo 2 to have all this items (avg 3×2 size). Thats only a stash size, excluding inventory. I don’t remember reading it, but is 2×1 going to be the biggest space an item will take in the inventory/stash? If yes, than the stash is really big, compared to D2. Still i somehow would have liked an additional non-shared stash per character, as this would have been the reason for me to create more than five (one of each class). If you convert D2’s item sizes to D3’s system, then you would be able to store the complete D2 Grail in the combined space of your stash and inventory of 10 characters. A minor correction: armors indeed take up 2×1 space, but belts are an exception, since they only take up one square of space. OK, Flux. When you posted this news item, news item “Daily Diablo 3 Gameplay #9” disappeared. Where’d it go? I just came back to watch the Demon Hunter footage, by someone that doesn’t spam Bolo Shot, uses Evasive Fire to great effect against the Skeleton King, and can aim Caltrops pretty well. It’ll go up tomorrow. I’m doing them about every 24 hours, and that one wasn’t supposed to go up yet, but I hadn’t set the time stamp properly. Or even finished writing the post. When I placed crafting resources into my stash, do I have to replace them into invetory while visiting blacksmith ? I hope not. So far, yes, you do. of course, stashes are not personal inventory! That’s how it should be. I really like the account-wide stash. Enjoyed it in Torchlight. Quality video, hope all future videos will be the same. Only thing, the appearance only changes the look of the armor type items wich didn’t come through from the footage. (4×2,500)+10,000+(4×2,500)+50,000+(4×2,500) = 90,000 gold to unlock 3 tabs of stash. Seeing as low level Beta players are able to rake in 8,000 gold easily…being at only level 10 or so….I’d say 90,000 gold would be cheap peanuts at higher levels. And 3 tabs is quite an awful lot. If you have less than 3 characters, you’d be needing only 2 tabs, which works out to a mere 30,000 gold. Should be chicken feet at about level 30 or so. And how many of us would want as many as 5 characters before one touches level 30? The monetary scaling feels a little off. Potential rendering of banana notes…. If stash expansion was the only gold sink in the game, this would be a huge concern, but it’s not. The big gold sink is going to be crafting. It seems that max stash size is meant to be easily attainable. You are assuming that each bag costs the same amount to unlock. I’m not quite sure that’s the case. 50k gold for that tab. So yeah, it scales well. Just going off what we have now, the third tab’s cost is 5 times the amount of the 2nd tab’s cost. From this it may be that the 4th tab will cost 250k gold to unlock, and 1.25mil to unlock the 5th and final tab. But thats just very wild speculation at this point. Though if it were the biggest gold sink it’d sort of make sense. I say we wait and see what the 4th tabs cost is. for the beginning you could just create 10 chars instead of getting later stash stages, isnt it the same generally? Does anyone know if there is a reason to max the crafters on more than 1 character, I would assume you only would need to do it on one character since you get the shared stash and can make items for the others characters on the maxed crafters character? AFAIK, the artisans are shared account-wide. Yep, it’s been confirmed by beta testers. And I don’t give a damn about the arguments about item sinks, I am a collector, and my gems and runes alone will fill an entire panel or two. Maybe the pattern is like \each tab costs as much, as you had to pay in total for the previous one\? Then the fourth one would have to cost 250,000. Assuming I understood the scheme correctly. I don’t know … 350 spaces for ALL chars? Isn’t it a little too few (taking into consideration salvaging & selling)? I have actually wondered something similar. By handling gold and stash the way they do, along with the 10 char max (to claim, as they did, that it was easier on their servers is just stupid, as there was no max on WoW, even back in 04, as you could play on multiple servers), they practically force parents to buy each of their kids a copy, rather than just getting one for the family to share- which is rather sleazy, IMO. One more way to push the bar. Damn it to hell, are they trying to force to play stupidly twinked characters!? Why do the hate the true solo-style play so much!? ARGH! Based on these gold prices, it looks like gold won’t be as ‘abundant’ in big numbers as it was in D2. This doesn’t necessarily make gold any more valuable though – just means it drops in smaller denominations. So I’m still waiting to see how useful it ends up being: wow gold vs d2 gold. Liking what sounds like a fairly big stash once maxed out. Though if D2 items were any indication, I’d probably need several of such stashes anyway. With only 1 account per purchase – as I understand it – I don’t think that will be possible. 1) D3 has a single pool of items/gold for all your chars. So it’s a fine solution to item exchange. …350 squares… that is not enough, WAAAAY not enough. I know I will accumulate gems, runes, materials, socketed items, rare rings, rare orbs, all uniques and set, etc. I only hope you can “Send to Vault” some items or something, otherwise I will stop playing D3 when I run out of space ! Seriously, I hope there’s no limit to the number of characters you can create and that there is an infinitely expandable storage for items.